English is a remarkably rich and diverse language; so, for those who'd like to increase their knowledge and vocabulary acumen, there are some colloquial English words and phrases that should be at the top of the list for any ESL student. Many of these you've probably already heard, but you may not know their history or their exact meaning. The origin of phrases and expressions so many of us use daily, without even thinking about them, is a fascinating discovery. You may not crack open Shakespeare frequently, or even glance at a Bible, yet some of the most common expressions English speakers use are derived from those two sources. 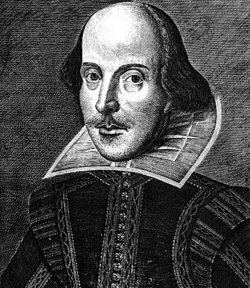 William Shakespeare was an incredibly popular playwright in his day. His plays weren't meant just for the highly educated or wealthy; common peasants sat in his audiences and greatly enjoyed the entertainment he brought them. Literacy wasn't that common in Shakespeare's time, the late sixteenth century, but one of the books everyone would have had a close acquaintance with was the King James version of the Bible. Shakespeare, writing for the masses, frequently used biblical metaphors and phrases. People in modern times may not easily get the allusions, but Shakespeare's patrons, even if they couldn't read, would know the biblical stories and phrases to which he was referring. Dead as a doornail - From King Henry VI, Part 2. The expression refers to the large nails used to stud doors in medieval buildings. The nails were nailed flat on the opposite side of the door, hence, a nail that was no longer useable, or "dead." A sorry sight - From Macbeth. This means an unpleasant-looking view or aspect. All that glitters is not gold - From The Merchant of Venice. This is a variation of "all that glisters." Shakespeare may not have invented the phrase, but he certainly popularized it. All the world's a stage - From As You Like It. All's well that ends well - The title of a Shakespeare play and it also appears in the text. Brevity is the soul of wit - It's self-explanatory, and part of a famous monologue in Hamlet. In the twinkling of an eye - Shakespeare used that expression in The Merchant of Venice, but this is another instance where he took his inspiration from the Bible. That phrase appears in 1 Corinthians, and is used to describe how at the end of time, God will raise the dead for the last judgment - a concept with which Englishmen of Shakespeare's time would have been very familiar. In a pickle - Have you been in a confused, mixed-up situation? Shakespeare's characters in The Tempest had similar problems, as they described in using that phrase. Neither a borrower nor a lender be - Another expression from Hamlet that gained popular traction over the centuries. It was so popular, in fact, that Benjamin Franklin used it as one of his aphorisms in his Poor Richard's Almanac. Ever pay a credit card bill with interest rates that made it seem impossible you'd ever get rid of the balance owed? You might think the credit card issuer wanted a "pound of flesh" from you. That phrase was popular centuries before that type of borrowing, and it was Shakespeare who popularized it in The Merchant of Venice. So take a look at your language. Your life and vocabulary can be immensely enriched by the variety of colloquial English words and phrases that have found their way from the Bible and Shakespeare's plays into everyday use. "Colloquial English Words and Phrases." YourDictionary, n.d. Web. 21 April 2019. <https://esl.yourdictionary.com/esl-for-students/colloquial-english-words-and-phrases-to-learn.html>. English is a remarkably rich and diverse language; so, for those who’d like to increase their knowledge and vocabulary acumen, there are some colloquial English words and phrases that should be at the top of the list for any ESL student.Many of these you’ve probably already heard, but you may not know their history or their exact meaning. The origin of phrases and expressions so many of us use daily, without even thinking about them, is a fascinating discovery.